live psychoacoustic performance of the electronic sound installation like she said, everything's fine. The Sculpture Center is hosting the first Cleveland exhibition to feature Sarah Paul's Little Miss Cleveland & the Flaming Sunset. The diva, dancing in ecstasy before the glowing sunset and swimming in Lake Erie, with images of those fiery Cleveland smokestacks she so loves, is found on shimmering and swaying silver walls in the Main Gallery. This video projection is fluid with the content changing through the run of the exhibition. Little Miss Cleveland is also present in the gallery to lead the visitor through her fragmented narrative with an inspired and expressive vocal melody. On opening night, Little Miss Cleveland will be found at sunset in a dramatic outdoor performance, created through the collaboration of Sarah Paul and Lauren Voss. 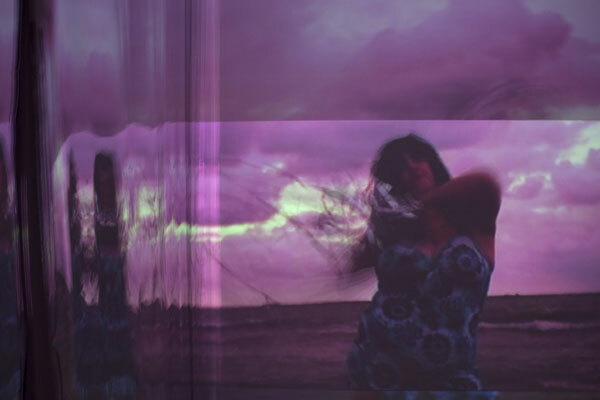 Sarah Paul's Little Miss Cleveland & the Flaming Sunset is an ongoing, transdisciplinary project, begun in 2009, that chronicles the exploits of an outrageous beauty queen and her love affair with post-post-industrial Cleveland and Lake Erie. She has regularly attended Cleveland Indians' games, to considerable public attention. Paul's work sprawls across artistic disciplines, attracting a diverse audience and engaging all of their senses in an exploration of the sultry, hazy territory generated by the integration of public performance and formal gallery display. Her varied oeuvre is intended to embrace and celebrate the cities of the Rust Belt. Read more about Sarah Paul in The Plain Dealer. Sarah Paul is Assistant Professor at the Cleveland Institute of Art where she has been teaching since 2007 in the Technology Integrated Media Environment (T.I.M.E.). She has been creating live performances since 2006. Most recently she was a Featured Artist at Visual Studies Alumni Invitational Exhibition, curated by Bill Maynes at The University Gallery, Center for the Arts, the University of Buffalo (fall 2011). In 2010, Little Miss Cleveland & the Flaming Sunset #4 was shown in Beyond/In Western New York 2010: Alternating Currents at the Albright-Knox Art Gallery, Buffalo, NY, curated by Holly Hughes. Also in 2010 The Unsung Torsos: An Experimental Opera in 13 Parts, commissioned by the Museum of Contemporary Art Cleveland (MOCA Cleveland) and SPACES (Cleveland), was performed at MOCA Cleveland. The artist received her MFA in Visual Studies from the University of New York at Buffalo (2007) and a BS in Mathematics at the University of New York at Albany (2004). 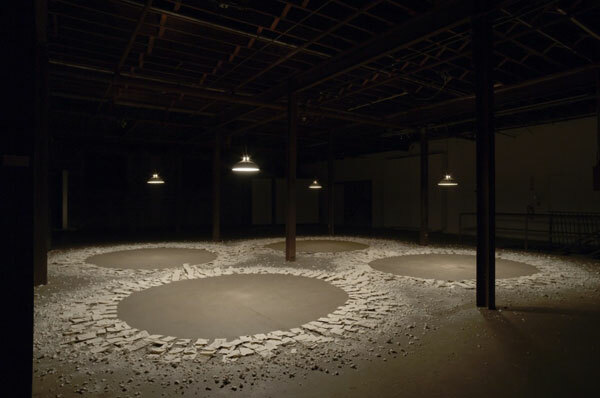 Lauren Herzak-Bauman, Memory Eternal, 2009, porcelain, incandescent light bulb, vintage light fixture, 20 x 25 x 25 ft. Image: Courtesy of the artist. Lauren Herzak-Bauman uses the medium or clay to express feelings of mourning and loss thereby transforming a gallery into a somber and reflective space. Drawing from the engrained culture of her childhood Russian Orthodox background, in which repetitive objects are used to mourn lost loved ones, the artist will install hundreds of porcelain memorial plaques emblazoned with fading images to recreate the processional aspects and paying of respect that are associated with loss. For her porcelain mimics the human condition in its strength and fragility, pure whiteness, and translucency' and is a conduit for remembrance. See brochure here. Herzak-Bauman, from Parma, OH, is currently working as an adjunct teacher at The University of Wisconsin in River Falls, WI, and teaching artist at the Northern Clay Center, Minneapolis, MN. She received her BFA from Bowling Green State University in 2004 and her MFA from the University of Minnesota in Minneapolis in 2009. She has shown for the last five years at galleries in Michigan, Florida, Pennsylvania, Wisconsin, and Arizona, among other places. Her work has been published in Art Forum "Critics' Picks," Metro Magazine for "The Austerity Cookbook," and in Cleveland Scene Magazine for "Speaking Volumes." Among her awards is a 2011 Artist Initiative Grant from the Minnesota State Arts Board. Sarah Ann uses familiar objects and materials to create abstracted architectural forms and exploits "their dimensional and prefabricated limitations to explore the impact that they can have with a new intention applied to them." Herzak-Bauman selected her because she sees Sarah's work as an equivalency of "an emotional landscape for the prairie land she calls home," with its stoicism and sensitive "beauty in the quiet spaces of the domestic interior." Sarah Ann received her BFA from University of Minnesota, Minneapolis, MN and is currently working as a Laser Technician at University of Minnesota Art Department. Her work has been included in several exhibitions in Minnesota. 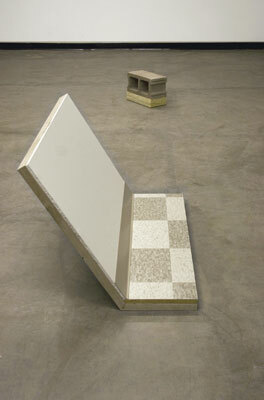 Sarah Ann, angel food and eight pound density, 2009, drywall, linoleum, lumber, cement, and carpet padding, 36 x 30 x 20 & 8 x 11 x 16 in. Image: Courtesy of artist.